The changes in Helston during my lifetime have been tremendous. Meneage Road and Meneage Street have changed almost beyond recognition and very few business`s of my boyhood days now remain. The two swift flowing kennels on both sides of Meneage Street are no longer visible which many would say was a good thing at one could easily meet with misfortune to say nothing of a very uncomfortable wetting. But what of the old gas lamp days (or nights)? Spaced so far apart that for illumination they were almost useless. John Rogers, known as `Old John Rogers from Gas’ouse` used to walk the rounds lighting these lamps by means of a long stick (or so it appeared to me) and would arrive at the last one, outside Bona Vista in Meneage Road, long after dark had set in. He would pop them on, one after another, and on completing the circuit, would wait a little while and then repeat the whole process in reverse. Thus those who enjoyed the advantages (if any) of living in the upper part of the town were less fortunate in enjoying the illuminations. Today we would have to remove the turf and concrete of the Air Station to discover what existed there prior to the mid 1940`s. There was, besides a football pitch and cricket ground, a banked cycle track. I can remember Tom Banfield of Nettles Hill (or Almshouse Hill) among others, riding around the track furiously. Tom, in his hey-day, was a cyclist of more than normal ability and was `wont` to compete in many cycling events, which in those days were very popular in the county. I do not, however, remember whether the riding I saw was for practice or competition, but I do know that the track became neglected and in a few years the gorse and heather had taken charge and I, with others of my age, fought off many `Cowboy and Indian` attacks there. Helston Downs was an open space. Just inside the lower end was a large stone pile, the result of “SPALLING”. Men equipped with long thin handles, usually of hazel about three feet in length and with an iron hammer-head about 1lb weight, `spalled` (broke) these rocks into more amenable sizes. These piles were the results of many weeks labours and extremely hard work it was. Among those who laboured there was Mr Ernie Endeen. He, wearing black wire meshed goggles would greet us kids with “Hullo my dears, now run along”, which was a kindly and well intentioned remark entreating us not to get in his `line of fire`. A warning often accompanied with a `Zing` as a piece of stone would go flying past. I have been told that the quantity of stone these men were expected (and did) to produce in a days work was a cubic yard. Sometimes mechanical crushers were employed to break these stones. 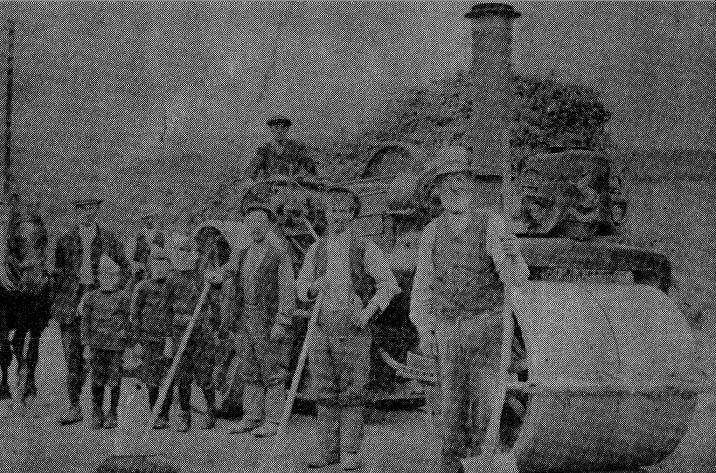 These crushers were worked by a steam engine and were the same (at least in principle) as those in use in Penlee Quarries on the far side of Mount`s Bay. After the crushing and spalling, horse drawn carts would come along and remove the stone. It would later be spread over portions of the highway which was deemed to be in need of repair. It was then the custom to leave it there in this state, for sometimes weeks, for the traffic to `work in` until a steam roller came along. I can remember going to my Grandmothers house at `DODSONS GAP` (now under the Air Station) on our bi-weekly visit and my mother complaining at having to drag my push chair or `Go-cart` over these stones. On one occasion it stretched from the present Cottage Hospital to `White House` and of the struggle the poor horses had to haul those heavily laden buses over these lengths of torture.